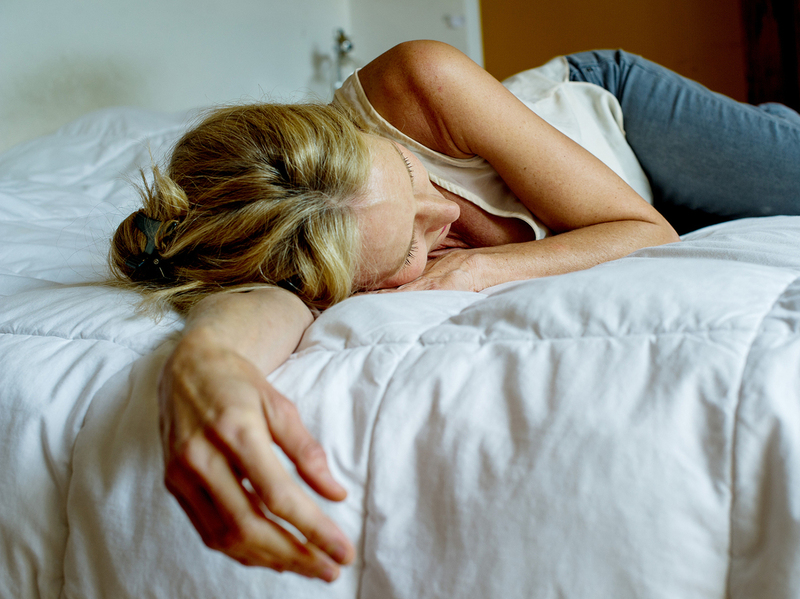 Older Adults' Forgetfulness Tied To Faulty Brain Rhythms In Sleep : Shots - Health News As people get older, brain waves that occur during deep sleep become less synchronized. This appears to disrupt a system that saves new memories. As people age they may forget more because their brain waves get out of sync, new research finds. Older brains may forget more because they lose their rhythm at night. During deep sleep, older people have less coordination between two brain waves that are important to saving new memories, a team reports in the journal Neuron. "It's like a drummer that's perhaps just one beat off the rhythm," says Matt Walker, one of the paper's authors and a professor of neuroscience and psychology at the University of California, Berkeley. "The aging brain just doesn't seem to be able to synchronize its brain waves effectively." The finding appears to answer a long-standing question about how aging can affect memory even in people who do not have Alzheimer's or some other brain disease. "This is the first paper that actually found a cellular mechanism that might be affected during aging and therefore be responsible for a lack of memory consolidation during sleep," says Julie Seibt, a lecturer in sleep and plasticity at the University of Surrey in the U.K. Seibt was not involved in the new study. To confirm the finding, though, researchers will have to show that it's possible to cause memory problems in a young brain by disrupting these rhythms, Seibt says. The study was the result of an effort to understand how the sleeping brain turns short-term memories into memories that can last a lifetime, says Walker, the author of the book Why We Sleep. "What is it about sleep that seems to perform this elegant trick of cementing new facts into the neural architecture of the brain?" To find out, Walker and a team of scientists had 20 young adults learn 120 pairs of words. "Then we put electrodes on their head and we had them sleep," he says. The electrodes let researchers monitor the electrical waves produced by the brain during deep sleep. They focused on the interaction between slow waves, which occur every second or so, and faster waves called sleep spindles, which occur more than 12 times a second. The next morning the volunteers took a test to see how many word pairs they could still remember. And it turned out their performance was determined by how well their slow waves and spindles had synchronized during deep sleep. "When those two brain waves were perfectly coinciding, that's when you seem to get this fantastic transfer of memory within the brain from short term vulnerable storage sites to these more permanent, safe, long-term storage sites," Walker says. Next, the team repeated the experiment with 32 people in their 60s and 70s. Their brain waves were less synchronized during deep sleep. They also remembered fewer word pairs the next morning. And, just like with young people, performance on the memory test was determined by how well their brain waves kept the beat, says Randolph Helfrich, an author of the new study and a postdoctoral fellow at UC Berkeley. "If you're like 50 milliseconds too early, 50 milliseconds too late, then the storing mechanism actually doesn't work." Helfrich says. The team also found a likely reason for the lack of coordination associated with aging: atrophy of an area of the brain involved in producing deep sleep. People with more atrophy had less rhythm in the brain, Walker says. That's discouraging because atrophy in this area of the brain is a normal consequence of aging, Walker says, and can be much worse in people with Alzheimer's. But the study also suggests that it's possible to improve an impaired memory by re-synchronizing brain rhythms during sleep. One way to do this would be by applying electrical or magnetic pulses through the scalp. "The idea is to boost those brain waves and bring them back together," Helfrich says. Walker already has plans to test this approach to synchronizing brain waves. "What we're going to try and do is act like a metronome and in doing so see if we can actually salvage aspects of learning and memory in older adults and those with dementia," he says.